Born in Bologna on November 3, 1726, he was ordained a priest in 1749 and graduated in theology in 1751. Undertaking missionary activities, he preached well in 62 dioceses in Italy. He founded the Opera Pia missions in preparation for missionary of the diocesan clergy. In 1775, he wrote the opera “Jesus at the heart of secular priest and regular church or considerations for each day of the month. He died on December 24, 1778. Roman Martyrology: In Bologna, Blessed Bartholomew Mari Dal Monte, a priest, who in many regions of Italy preached to the people and Christian clergy the word of God and with this purpose established the Opera Pia Mission. He emulated Saint Leonardo da Porto Maurizio (1676-1751), who was a great preacher in northern and central Italy. Bartholomew Maria Dal Monte was born in the scholarly city of Bologna, Nov. 3, 1726, to wealthy parents, was the fifth child of the couple, but four had died earlier after a few days after birth, his mother Anna Maria Bassani had prayed to St. Francis of Paola. He was raised by his family, protected with joy and anxiety, considered the most precious treasure of the house. At about seven years, on April 26, 1733, he was Confirmed by the archbishop of Bologna, Cardinal. Prospero Lambertini (1675-1758) who beame pope in 1740 under the name of Benedict XIV, who for several years continued to govern the diocese of Bologna. Equipped with lively intelligence, Bartholomew was entrusted by parents to the Humanities, the College St. Lucia Jesuit fathers; Hence also his vocation to the priesthood, which was opposed by his father. But Bartholomew Dal Monte, having known s. Leonardo da Porto Maurizio, the Franciscan preacher of mission to the people, the Lent spiritual exercises and propagator of the pious practice of the Via Crucis, admired his method and decided to devote himself to preaching and then finally chose the priesthood. 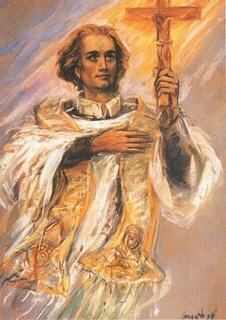 He was ordained a priest on December 20, 1749 diocesan administrator, sent by the Pope Benedict XIV, after ordering continued his studies, achieving a degree in theology December 30, 1751. After the first few years dedicated to art of preaching, Don Bartholomew Maria Dal Monte took on an extraordinary missionary activity, first in the parishes of the diocese of Bologna and then during all his 26 years of preaching generous, enlarged its scope of action to 62 dioceses in Northern and Central. He preached hundreds of missions to the people, Lenten and retreats to the clergy, to both religious and laity, gaining admirable conversions and many people rappacificazioni between opponents. At a time when the widespread negative consequences of some kind of Enlightenment philosophy and a disheartening giansenistico puritanism, his mission became moments of intensive religious education for all the faithful, explicit Christianization of capillary action. His preaching was always free from excessive and inappropriate penalties, but used the word strength, sobriety and method, so as to be called missionary of discretion. He followed throughout his life the ministry of Christ himself, uncompromising in proclaiming the truth, but welcoming and merciful toward sinners; a true priest of God, he was totally dedicated to the salvation of souls and had a great devotion to Mary, Mother of Mercy. In 1774 at 48, he was called by the Cardinal Vicar of Rome to preach the solemn mission in Piazza Navona and in preparation for the Holy Year 1775, to hold the retreat to the clergy in the Roman Church of Jesus; tasks that testify to the high esteem and reputation, which he had as preacher. Pope Pius VI wanted him to remain permanently in Rome, but he refused to discontinue his mission of evangelization among the people of the countryside, and the archbishop of Bologna exempted from office of the rector of a seminary in which initially had been designated for leave him free to preach in exhausting missions, which then took place without the help of sound technology, but with the voice tiring. Devoured by zeal, he offered to go to the missions in India, but due to his precarious state of health, he was dissuaded by his superiors. Using the property inherited from his father, he founded the “Opera Pia Mission” to give strength and continuity to the people’s missions, using sensitive and intelligent people. But he wanted above all for his Opera to be a source of apostles; diocesan priests in full communion with the bishop, were totally available to preach, as he was convinced that no one could be self-taught in the difficult life of the preacher. He created structures suitable for the training of his employees, paying them interesting spiritual writings, drawn up personally. Among these writings should be notified when the operetta: “Jesus in the heart of secular priest and regular church or considerations for each day of the month”, published in Rome in 1775 and in several subsequent years, until issued by the Vatican in 1906. The text was modeled on the writings of the priest F. H. Sevoy (1707-1765) and became a significant point of reference for the training of generations of priests; this text is added to some practial religious pamphlets, in which shines through the daily for the salvation of souls, his commitment and pastoral ascetic. Being a man of solid education, holding a degree in theology, with total dedication to Christ, Devotion to Mary trusting, staunch defender of priestly dignity, missionary preparation and zealous, Bartholomew Dal Monte could yet be considered, a current model of priestly spirituality in the service of evangelization. Two months before concluding his existence, exhausted by the apostolic labors during his last mission, he said: “I’m going to die in Bologna the night of Christmas” and actually for pulmonary complications, died on December 24 ,1778, comforted by the sacraments and visit by the archbishop, when he was only 52. Buried in the Basilica of St. Bolognese Petronio, he was declared venerable on January 23, 1921 by Pope Benedict XV and proclaimed blessed in Bologna on September 27, 1997, by Pope John Paul II. This entry was posted on Wednesday, December 24th, 2008 at 2:40 am and is filed under Beatified by John Paul II, Catholic. You can follow any responses to this entry through the RSS 2.0 feed. You can leave a response, or trackback from your own site. Merry Christmas to you and all the wonderful people of The Black Cordelias. You do a wonderful job with this blog. And special wishes to my friend Simple Sinner, dog lover par excellant!